Welcome to Day Four of Sailor Parties Week! This week we’ve shared a roundup of some incredibly creative sailor party ideas, free sailor party printables, sailor-themed crafts and today we’re sharing a sailor party game – charades! To view all of the sailor ideas we’ve shared, visit our Sailor category. Do you know how charades work? Here’s a quick overview of how to play the game. 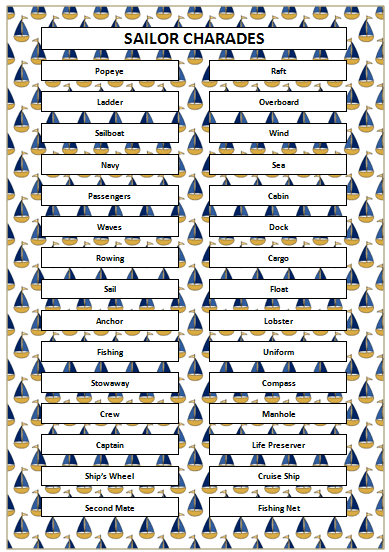 1) Print the free printable sailor charades game. 2) Cut out each of the charades, fold each charade in half and place them in a bowl. 3) Split your group into two teams – Team A and Team B (or you could give yourself fun sailor team names!) and decide which team will go first. 4) All of the players will have a turn being an “actor”. The actor randomly selects a charade from the bowl and then has 30 seconds to act it out for their team to guess. Remember, there is no talking in charades! If the team guesses the charade, the team earns one point. If the team doesn’t guess correctly, the other team has one chance to guess the correct answer to win a point. The game continues with each team taking turns and alternating which player gets to be the actor. For even more free games, visit our Free Printables page. For more theme party ideas, party planning tips, free printables and more, visit our Birthday Party page. We’re always adding new ideas. For the latest updates, follow us on Facebook, Twitter, Pinterest, Google + and Bloglovin’. How fun! My son loves pirates and sailors, so I am bookmarking this to come back later!